June 2014 Update: I figured out that a presentation might help to convey and spread this 6 topics even better. So take a look, download it if you like and don’t forget to let me know what you think! As noted in the 2015 Guide to Enterprise Social Media Management Software, companies are slowly shifting their approach to social media, from an isolated marketing channel to an integrated part of the business. As companies increase their sophistication from a minimally viable social media presence to an integrated, strategic approach to leveraging social media across the organization, a few things tend to happen. First, responsibility shifts from less than one FTE (typically in the marketing or communications department) to a small, dedicated team within one department to a team servicing multiple departments to a holistic approach, where many individuals in the company participate. Second, organizations start to leverage social media in multiple ways, from reputation management to customer service to finding advocates to market research. Finally, companies engage the help of more sophisticated technology to manage, measure, and analyze social media activities. This shift has been underway for a few years, so Simply Measured, a social analytics solution, commissioned TrustRadius to survey the state of social media marketing today. Specifically, where do companies sit on the social media maturity spectrum? What are their main goals, and what are the biggest challenges they face? Do they have access to and are they using the right metrics to understand whether they are meeting those goals? Are they satisfied with the technology they use to support their social media activities? 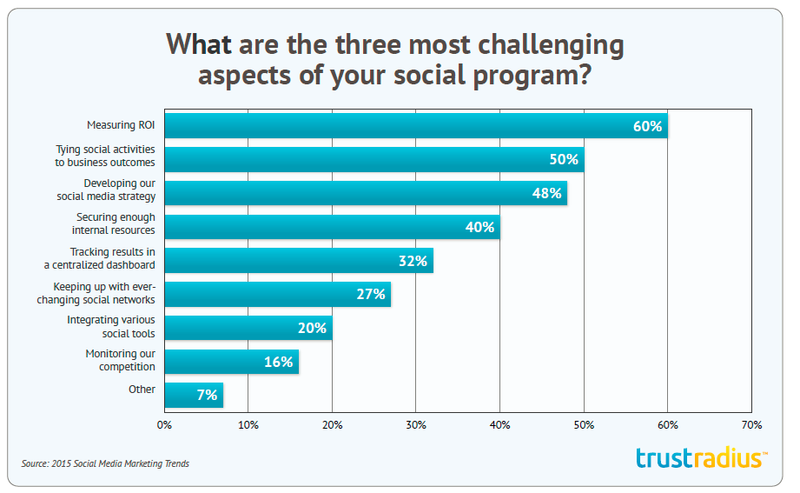 Nearly 600 social media practitioners – from consultants to CMOs to community managers – took the survey in February/March 2015, responding to questions about the status, goals, and challenges of their social media programs. 1. Demonstrating the value of social programs is the number one challenge. Companies of all sizes and maturity levels are struggling to prove the value of their social programs. Social media activities can be difficult to quantify, and marketers are trapped between readily available “vanity metrics” such as likes and followers and difficult-to-measure objectives such as brand awareness. 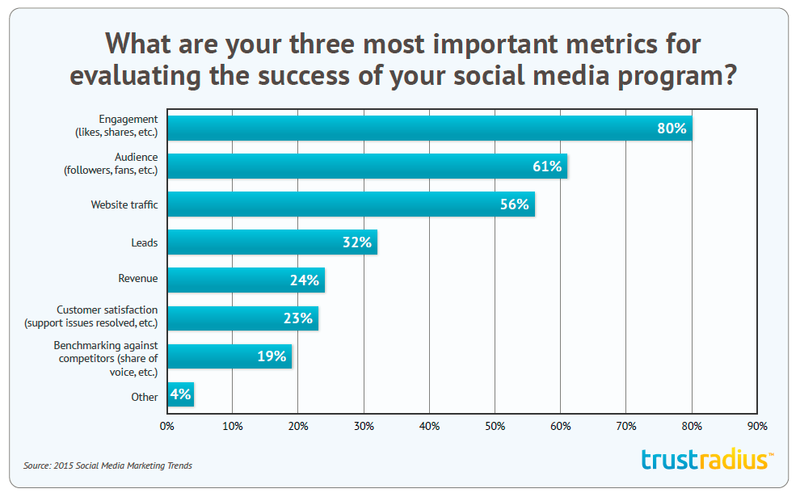 “Measuring ROI” was the most commonly cited challenge; 60% of respondents included it as one of the top three most challenging aspects of their social media program. It’s followed by “Tying social activities to business outcomes” (a similar challenge) and “Developing our social media strategy”. “Tying social activities to business outcomes” – the second most common challenge among survey respondents – could be a more mature method to evaluate the impact of social on the overall business, and allow marketers to use social media in the most effective way, rather than forcing it to fit into a specific ROI model measured directly in sales. Another indication of the fact that marketers are struggling to measure and communicate the impact of social is the fact that they are still largely focused on easy-to-access vanity metrics such as likes, shares, followers and fans to evaluate success on social media. “Engagement” (such as likes, shares, etc.) is considered the most important metric for evaluating success; 80% of respondents identified it as one of the top three metrics. Audience size and website traffic are also important, with 61% and 56% choosing them as one of the top three. Notably, all three of these metrics are easy to track. However, they don’t always tie directly to business goals such as revenue or customer retention. Metrics that are more difficult to track (yet tie more directly to broader business goals), such as revenue and customer satisfaction, are among the top three most important metrics for less than a quarter of respondents. The focus on engagement is understandable though possibly misplaced and has the potential to lead to ineffective social strategies. According to this Scribd article discussing engagement on Facebook, online engagement metrics are not always an indication of the persuasiveness or effectiveness of content. Engagement metrics alone are not an effective indication of campaign success; it’s also necessary to measure real business outcomes attributable to social campaigns, such as customer loyalty or sales. 2. Social media is largely not yet integrated into the overall business. 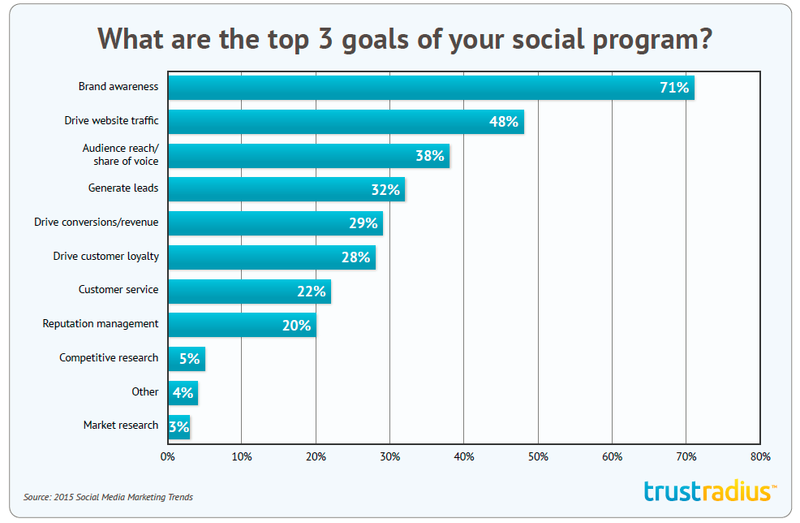 Social media goals are not wholly aligned with overall business goals. Furthermore, while marketers largely feel they effectively leverage social media data and analytics to optimize their marketing strategies, they don’t feel social media data impacts their company’s overall business strategy. The focus of social media efforts is overwhelmingly on top-of-the-funnel activities. Overall, brand awareness is by far the most common goal; 71% of respondents identified it as one of the top three goals of their social programs. It’s followed by driving website traffic and audience reach / share of voice – also top-of-the-funnel measures. As mentioned above, the most common goals of social media programs are both top-of-the-funnel and, with the potential exception of website traffic, difficult to tie back to real business outcomes. Overall business goals are more likely to also include goals tied directly to revenue, such as increase conversions, tap into a new market, reduce churn, etc. In terms of both strategy and measurement, most companies have not been able to align social media efforts with the broader business objectives. It is still a channel that companies know they need a presence, but aren’t always sure how to leverage it. Marketers do generally feel they effectively use social media data to inform their social media marketing strategy and to optimize their social campaigns. 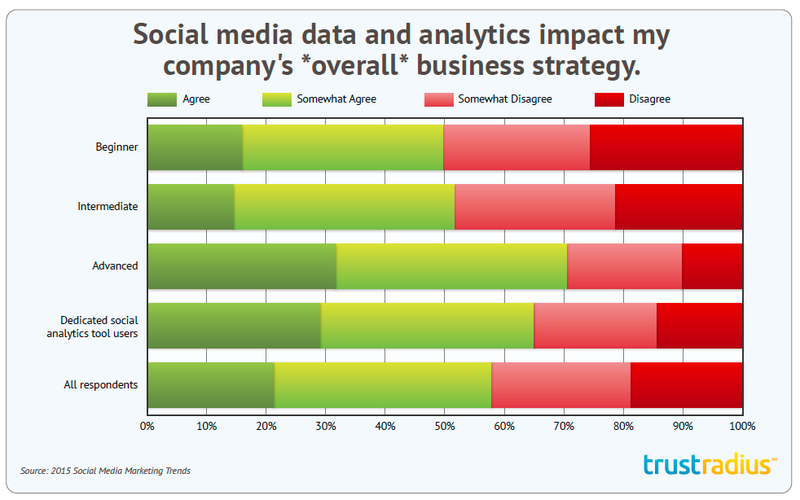 However, agreement declines significantly when we asked whether social media data and analytics impact the company’s overall business strategy. Marketers feel they are able to effectively leverage social data within their campaigns, but businesses aren’t leveraging this data beyond the silo of social media marketing. While broad potential uses of social data have been much discussed in the industry (informing product development decisions, discovering new customer markets, testing messaging strategies, surfacing issues such as outages or product failures, etc. ), these approaches are still not widespread. 3. 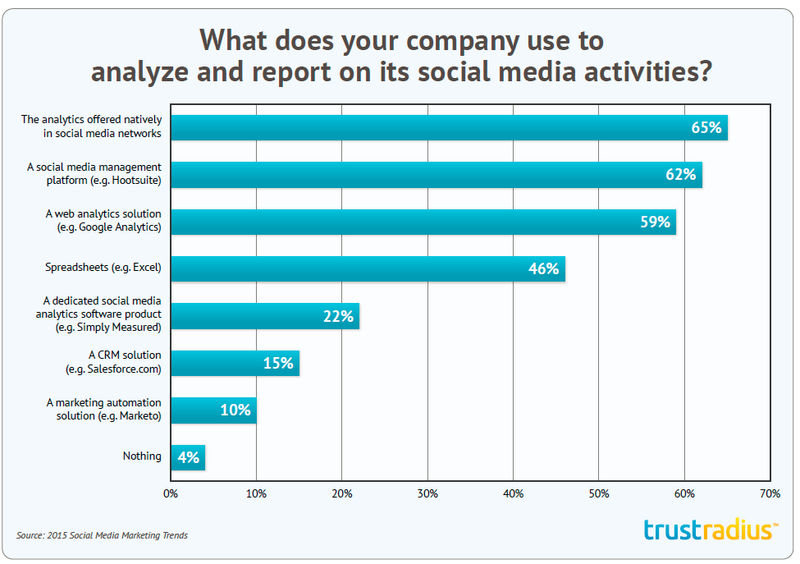 Companies don’t have the right set of tools to manage and measure social media activities. Marketers are using multiple sources of data and multiple technology products to manage and measure social media activities. Though they largely trust the data they get, they still aren’t able to interpret the data to show value, and many aren’t satisfied with their set of tools. Most companies are using one to two software products to manage social media activities. Many are using three or four. Larger companies tend to use more tools. In terms of measurement, companies are using an average of three different tools to report and analyze their social media activities. The most commonly used tools are the analytics offered natively in social media networks (64% of respondents), a social media management tool (62%), a web analytics tool (59%), and spreadsheets (46%). Respondents largely trust the data they get from these multiple sources of analytics. The vast majority of respondents feel they understand their social media audience. 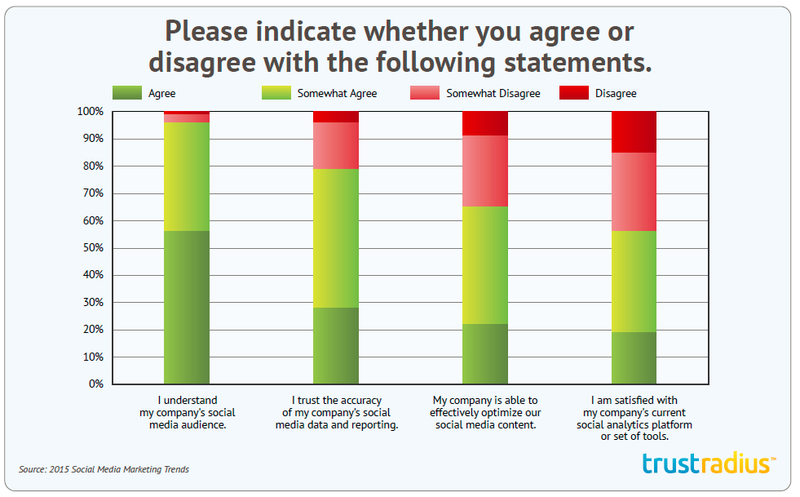 Additionally, 26% agree and an additional 49% somewhat agree that “I trust the accuracy of my company’s social media data and reporting.” However, agreement declines when respondents were asked about their ability to optimize social media content and their level of satisfaction with the tools used for social analytics. Potentially, marketers trust the accuracy of the data, but feel analytics tools could do a better job of helping them interpret the data and use it to optimize their campaigns and strategies. Many of these findings are true regardless of company size (from small businesses to large enterprise) and regardless of where companies fit on the social media maturity spectrum. All of these findings represent a prime opportunity to (a) educate their customers on building a social media strategy that is realistic, measurable, and supportive of overall business goals, and (b) help their customers take the leap from collecting data to surfacing insights. Once marketers are better equipped to define and demonstrate the value of social media to the business, other common challenges, like garnering enough internal resources, will be diminished. The rest of this report explores these findings in greater detail and provides key survey results. What about external trends that are ready to blow up? Often times, during events and conferences you’ll be listening to the same old themes: “Be engaging!” “Pay attention to your audience!” “What’s going on with the millennials!?”. However, for 2015, let’s put much bigger emphasis on, “What’s next?”. Leading marketers have already conceptually, and even tactically, moved on from the traditional video format. A couple months ago, Jameson made headlines by going beyond the traditional confines of normal Facebook and Instagram ad spots. This is something we can expect to see much more of, and then some. Jenny Hodgson, Lead Marketing Manager of Digital Innovation for AT&T, said that her team is keeping up with the pace of 3D’s evolving technology and are excited about the application of it in their social programs. Hodgson and her team are not the only ones. Word is that Volkwasgon has plans for next year’s Super Bowl campaign. It’s only a matter of time people. As marketers, we understand that social listening is the process of monitoring keywords and conversations on social in real-time. We’re all keeping an eye on the conversations happening around our brand, our industry, etc. But now that visuals are the most-used content type across social networks, the conversation isn’t happening via text — it’s happening via images. We have to start listening to visuals. 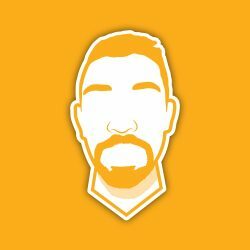 Ditto is a tool that can scan images for brands’ logos. For example, if I were to Tweet “I LOVE ICE CREAM” and include a photo of my favorite kind of Ben and Jerry’s Ice Cream (Phish Food – duh), but not tag or mention Ben and Jerry’s, Ditto could still find the image if the logo was present. Ben and Jerry’s has 237,000 followers, and 123,725 people sharing B&J’s in photos, but only 26,625 mention “Ben” or “Jerry” in their text. That is a huge disparity and this type of visual analysis will become infinitely useful to marketers over the coming years. For social media marketers like myself, this can be quite a scary concept. Our role is changing, but that couldn’t be more exciting, IMO. Doug Busk, the Global Director of Digital Communications and Social Media for the Coca-Cola Company, said it best, “Social networks are amplification networks. Amplification networks for the content we’re creating.” However, this “content” that no one can seem to say enough about is never one-size-fits-all. Each piece of content should be pivoted to be mindful of each channel’s strengths. 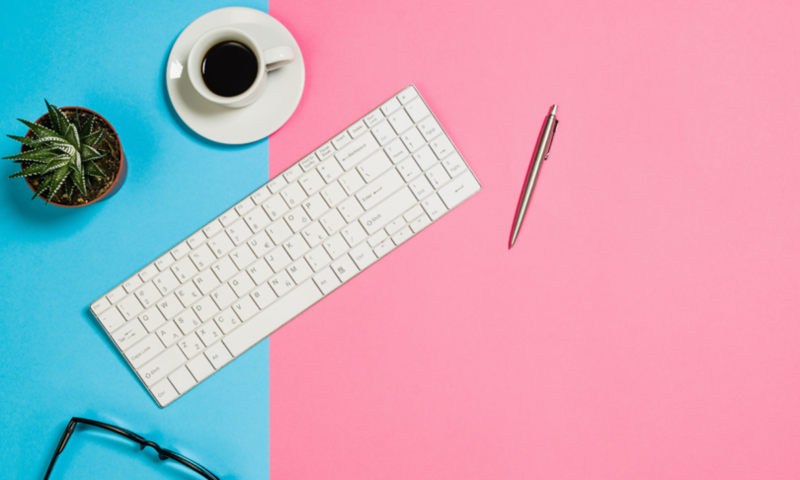 Twitter is a news source, Facebook is a storytelling venue, LinkedIn is professional, Instagram is for high-quality visuals, etc… Making sure your content fits into each of those networks is of the utmost importance for a social media marketer. This emphasis is creating a niche for a new breed of role, a social-content hybrid marketer.